Can you freeze shredded or grated zucchini? Yes! And there's nothing to it. One of my most popular posts this time of year is How To Freeze Zucchini and Summer Squash (and My One Claim to Fame). Hopefully someday I'll actually have a surplus of zucchini (and be able to give up my one claim to fame), but in the meantime, Farmgirl Fare readers offer advice for using frozen shredded zucchini in this thread on the Farmgirl Fare Facebook page. If you have any tips to share, please join in the conversation! And if you make these muffins with frozen zucchini, I'd love to hear about it. 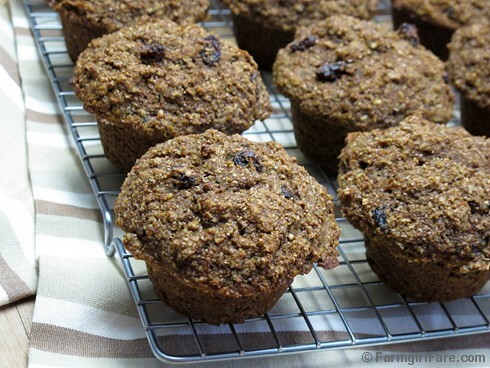 These moist and healthy muffins are sweetened with honey and/or molasses and are made without bran cereal. A lot of my favorite foods taste great but don't photograph all that well, like Kohlrabi Purée, or this Slow Roasted Dutch Oven Lamb with Tomatoes, Onions, Rosemary, and Red Wine. And bran muffins. So forget the photos and just go mix yourself up a batch of this new version of my super popular 100% Whole Grain Bran Muffins. They're flavorful and moist, packed with healthy vegetables and fiber goodness (but you don't have to tell anybody that part), freeze beautifully, are made without bran cereal and processed sugar, and taste really good. With all that going for you, who needs to look good in pictures? One of the best things about having a food and farm blog is hearing from readers all over the world who not only love to cook but are also interested in knowing where their food comes from. Karen Perry Stillerman is one Farmgirl Fare fan who goes a step beyond just caring. She's a senior analyst (and new blogger!) for the Food & Environment program of the Union of Concerned Scientists in Washington D.C., the leading science-based nonprofit organization working for a cleaner environment and a safer world. What began as a collaboration between students and faculty members at the Massachusetts Institute of Technology in 1969 is now an alliance of more than 250,000 citizens and scientists. The goals of the UCS Food & Environment program are "to promote sustainable agriculture practices like organic and pasture-based systems while eliminating harmful 'factory farming' methods and strengthening government oversight of genetically engineered food." Sounds like good work to me. Check out their most recent report, Market Forces: Creating Jobs through Public Investment in Local and Regional Food Systems. Yes! A few months later she told me about her new apple blueberry version and said, "I'm starting to think that I can put just about anything in those muffins, and they'll turn out to be delicious!" This adaptation of her carrot, raisin, and zucchini variation helps to prove the point. 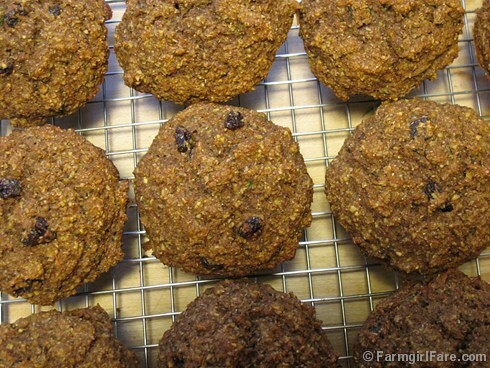 Thanks so much to all of you who have taken the time to come back and leave a comment on my original bran muffin recipe post, letting me know how much you've enjoyed the recipe—and, more importantly, for sharing all the wonderful ways you've made it your own. Be sure to check the comments section of that post for lots of delicious bran muffin inspiration. Over the past few years I've noticed that the texture and weight of both wheat brans and oat brans can vary considerably, and some are much heavier than others. If you're weighing your brans (I love my 11-pound Oxo Good Grips digital kitchen scale), you might want to also portion them out in measuring cups the first time, which is how I measured them when I created the recipe, and if you've weighed out significantly more or less bran than the recipe calls for, considering altering the amounts. I've used both finely shredded and coarsely shredded carrots and zucchini in these muffins and find that the finely shredded bakes up a little better. Some people like to squeeze the moisture out of their shredded zucchini, but I never bother. If you're trying to use up a bumper crop of squash, you can replace some or all of the carrots with extra zucchini. Next time I'm going to try using just carrots and raisins. As always, I urge you to seek out local and organic ingredients, as they really do make a difference. You can often find beekeepers selling interesting flavors of honey and fresh eggs laid by happy chickens at farmers' markets. Search for other foods grown close to home on LocalHarvest.org. Look for organic flour and brans in the bulk bins at natural foods stores. Organic yogurt and milk are thankfully now mainstream, or you might even try making homemade yogurt, which takes wonderful and is really easy. Organic raisins and carrots are two of the best organic buys around. I love these muffins with butter and a hot cup of tea, or with peanut butter and apricot jam and an ice cold glass of milk. They taste even better the second day. Place an oven rack in the middle of the oven and heat the oven to 375°. Grease a standard size 12-cup muffin pan or line the cups with unbleached baking cups (I love my Chicago Metallic commercial muffin pan—I spray it with Spectrum Naturals Canola Spray Oil and the muffins come right out of the pan, leaving almost no mess). Combine the wheat bran, oat bran, whole wheat flour, baking soda, baking powder, cinnamon, and salt in a large bowl and set aside. Pour the wet ingredients into the dry ingredients and mix with a rubber spatula just until combined. Gently fold in the zucchini, carrots, and raisins. Generously overfill the muffin cups with batter. I use a large stainless steel scoop, which is also great for portioning out cookie dough. Bake until a toothpick inserted in the center of a muffin comes out clean, about 25 to 30 minutes. Cool in the pan for 10 to 15 minutes, then carefully remove the muffins from the pan and serve warm, or let them cool on a wire rack. These muffins will keep for up to 3 days in an airtight container in a cool place, or you can freeze them. I just toss them into a zipper freezer bag as soon as they've cooled completely. Defrost at room temperature (I like to pull them out the night before) or in the microwave if you're in a hurry. © FarmgirlFare.com, where Farmgirl Susan shares recipes, stories, and photos (but not surplus summer squash) from her crazy country life on 240 remote Missouri acres. Those are definately a very healthy muffin. I just found your blog through a comment you left on Three Many Cooks blog. I have been enjoying reading through some of your posts and of course checking out your recipes. You are so right about some foods not photographing well, black bean soup falls into this category too! The muffin recipe looks awesome and after a few tweaks to fit my dietary needs I will give it a try. What kind of cooking spray do you use? I use the same loaf and muffin pans as you and have been rubbing oil on them with a paper towel, but the breads stuck yesterday (argh!!). Would putting the quick breads on the baking stone affect this as well? Love your site -- very inspirational. Oh, it's so disappointing when bread or muffins stick to the pan isn't it? For the past few years I've been using Spectrum High Heat Canola Spray Oil which is naturally expeller pressed and doesn't contain any weird additives like many cooking and baking sprays do. One can lasts me several months, and I do a lot of baking. So glad you're enjoying my blog. Happy baking! Guess what just landed in my amazon cart :). Thank you for taking the time to reply -- I've been anxiously checking and hoping for a reply like a love-struck junior-higher. You've made my day! You're so cute. :) Glad I could help. I hope the spray oil works as well for you as it does for me! I don't usually remember to come back and comment on food blogs when I've tried a recipe, but since I came back to make these muffins again, I thought I'd give you a virtual pat on the back, too. They. Are. Marvelous. I didn't have molasses so I improvised with maple syrup and honey as the sweeteners and I can't believe how delicious these muffins came out. I froze a batch and they tasted just as good after they'd thawed again as they did the first day I made them. I made a special trip to the store to get more wheat bran so I could make more. Thanks for the recipe! !